It is another edition of Show Your Stuff. Yes I know, I have the same picture of the Caramel Clusters I had last week, however this time I am sharing the recipe. Mix chocolate chips and butter, and melt over a double boiler. 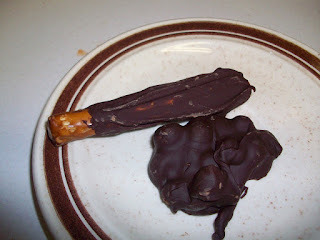 Remover from heat and let the chocolate cool down a few minutes. You don't want it too hot or it will melt the caramel. Add the caramel bits. Spoon teaspoon size clusters onto cookie sheet cover in parchment paper. Let solidify in refrigerator. Once solidified, store in airtight container in refrigerator. oh yum! And thanks for hosting! So excited to be linking up to your linky party this week! Thanks for joining my Planet Weidknecht Weekend Hop! Your site is making my tummy grumble! Everything looks so good! Thanks for hosting! And thanks for commenting on my post! I designed The Feeder Frock nursing cover, so I linked that up with our Etsy Shop. I am linking up, thanks for hosting! Thanks for sharing at my party. Can't wait to see what you link up next week! Thanks for hosting! Those look SOO good!!! Sorry I'm so late. This looks great. Thanks for sharing with Simply Delish.